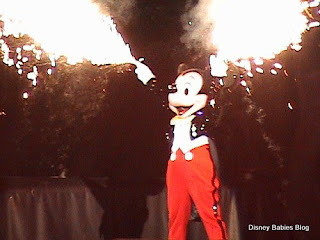 Disney Babies Blog: To Fantasmic or not to Fantasmic? 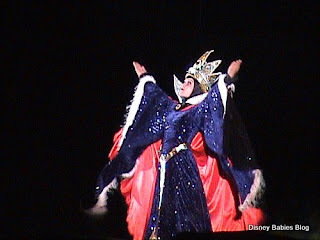 Fantasmic or not to Fantasmic, that is the question (with a baby!) I think Fantasmic IS fantastic, however it doesn't work for all ages. For those of you who are unfamiliar, Fantasmic is the evening show at Hollywood Studios. It is shown in their outdoor auditorium, and it is AMAZING! It has fireworks, characters, boats, fire, and 3 giant screens made from sprayed water that images are projected on. It gets very loud and dark at some spots, and it might not work for all kids. Piper was 6 months when we went to see it, and we were lucky. She fell asleep before the show started, slept through the entire thing, and slept through the MADNESS that was exiting. The theatre can hold up to 6,900 seated guests, so getting out the ONE entrace is a pain. And, strollers aren't allowed past a certain point so you have to carry your kids to keep from losing them in the crowd. I really enjoy Fantasmic, but I've seen it enough (and probably have the entire thing on video somewhere) that I don't need to redo it for a while. Maybe if Piper asks to see it one day, we'll take her. We took the chance on our last trip bringing our three kids (at the time ages 5, 3.5 and 2). I was concerned about they would react, but optimistic. I had brought glow sticks from home (super cheap at the dollar store) and gave one to each of the kids. It gave them that slight bit of light without distracting those around them. They all made it through the entire show, but I think the fact that they knew every villian in Fantasmic, made it a little less scary. I think if a child had no idea who some of the characters were, it would definitely be very scary at some parts. My kids loved it and are looking forward to going back next trip and I can't wait!